Startup Lydian Dental aims to disrupt the dental industry by offering a mobile office that comes to you and lets customers pay a monthly subscription fee for its service. Founded in 2014, Lydian hopes to offer a cooler, more user-friendly program that will appeal to millennials, many of whom may neglect dental upkeep due to factors like inconvenience or unpleasantness. 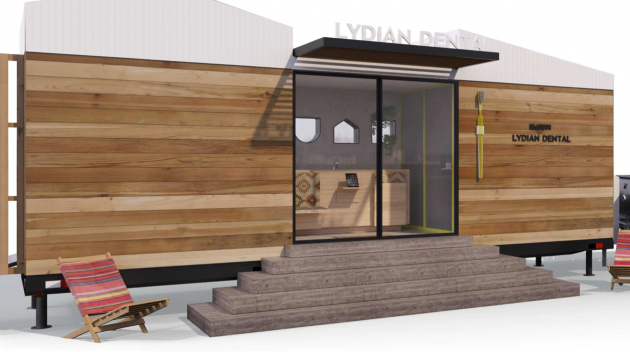 Currently the startup has four permanent clinics in Arizona and Texas, and recently partnered with design firm Rapt Studio to build RV-style mobile dental clinics that look like tiny houses, which Lydian hopes will meet clients’ need for elevated convenience. The permanent offices feature airy, windowed spaces and blue interiors that encourage relaxation, while the mobile units are made to look like welcoming house-fronts, complete with wooden panels, sliding doors and steps. Overall, Lydian hopes that its efforts will serve to reinvent the sometimes harrowing experience of visiting the dentist by offering a service that is more personalized and enjoyable.